Prime Minister Binyamin Netanyahu thanks Bulgarian Prime Minister for the investigation into the terrorist bombing in Burgas last July. Prime Minister Binyamin Netanyahu spoke on Wednesday evening with Bulgarian Prime Minister Boyko Borissov and thanked him for his country's thorough and professional investigation into the terrorist bombing in Burgas last July. Netanyahu told Borissov, "The findings of the investigation are clear and prove that Hizbullah was responsible for the atrocity in Burgas. This is an additional indication that Iran, through its proxies, is conducting a global terrorist campaign that crosses borders and continents. “I hope that the Europeans will draw the necessary conclusions regarding the true character of Hizbullah after this criminal attack on European soil against an EU member state,” he added. 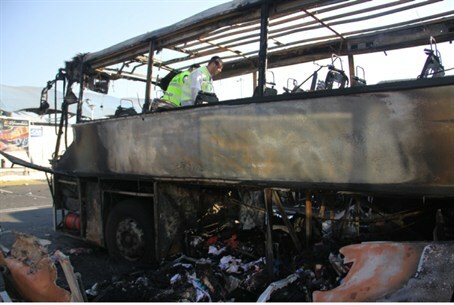 On Tuesday, Bulgaria officially blamed Hizbullah for the Burgas terror attack, in which five Israeli tourists and a Bulgarian driver were killed when a suicide bomber blew himself up near a tourist bus. Netanyahu released a statement Tuesday after Bulgaria officially blamed Hizbullah for the attack, in which he called on the international community to recognize Hizbullah as a terrorist organization. Hizbullah, meanwhile, accused Israel on Wednesday of waging an “international campaign” against it. Naim Kassem, the terror group’s second in command, slammed the “international campaign of intimidation waged by Israel against Hizbullah,” adding that it is “ever improving its equipment and training” in order to bring about the destruction of the Jewish state. U.S. Secretary of State John Kerry on Tuesday urged Europe to cut off funding to the Hizbullah terror group in the wake of its responsibility for the Burgas attack. "We strongly urge other governments around the world -- and particularly our partners in Europe -- to take immediate action to crack down on Hizbullah," Kerry said. "We need to send an unequivocal message to this terrorist group that it can no longer engage in despicable actions with impunity," he added. Hizbullah has been on a U.S. terror blacklist since 1995 after a series of anti-American attacks, including the bombing of the U.S. embassy and Marine barracks in Beirut in the 1980s.